We believe a continued rise in oil prices would divide EM by economic performance. There are two main reasons for this. First, EM countries feel the economic impact of higher oil prices much more than developed markets (DM) because of the size of their economies. The majority of oil-producing and consuming countries are in EM; they are both more energy intensive and less energy-efficient than their DM counterparts. Second, a rise in oil prices has an asymmetric impact on EM economies; the macroeconomic cost to large net oil importers with weak economic fundamentals can be disproportionately larger than the macroeconomic benefit to net oil exporters. Why does this happen? To understand this asymmetry, it is important to understand what drives rises in oil prices. Two current reasons are the synchronized global growth expansion (despite having softened recently) and, more importantly, market concerns over supply. A supply-side driven rise is more likely to drive an economic wedge between oil importers and oil exporters. In the absence of a strong pick up in exports, the higher import cost of oil would worsen current account positions, compress profit margins and raise CPI inflation for oil importers in EM Asia, Turkey and parts of EEMEA. For large net oil exporters, demand and supply driven factors are less salient than for net oil importers. However, the benefits of a higher oil price can be substantial. Big EM oil exporters, such as Latin America and the Middle East, will reap a significant increase in commodity export revenues. This will improve their current account fiscal positions and increase profits in the energy sector. The result could be strong capital inflows and sovereign credit rating upgrades. 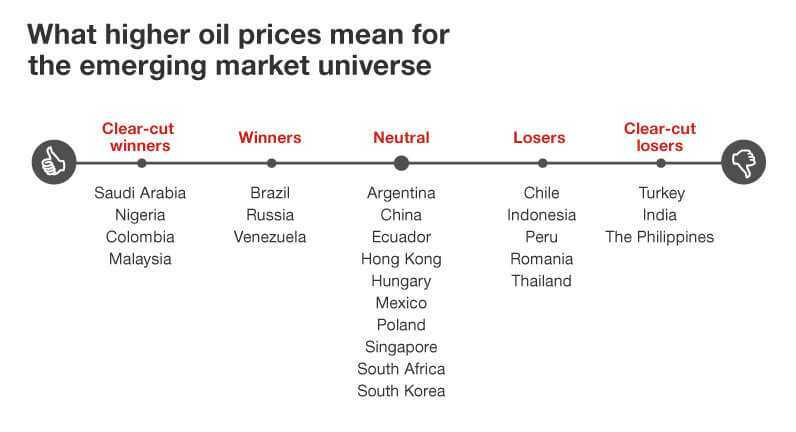 For more details about the potential impacts of rising oil prices on 26 EM economies, click here.